I love hearing about all of Leo's wonderful successes! Lights up my day. Riding a horse with a helmet is HUGE! Yay! Hooray!! How great is that??!! That is fabulous. My daughter loves riding a horse at camp too! you don't know me from adam, but i've volunteered with therapeutic riding programs for years, and this one is in your area and is AWESOME. www.bokranch.com, and the national org is www.narha.org just in case you weren't aware. 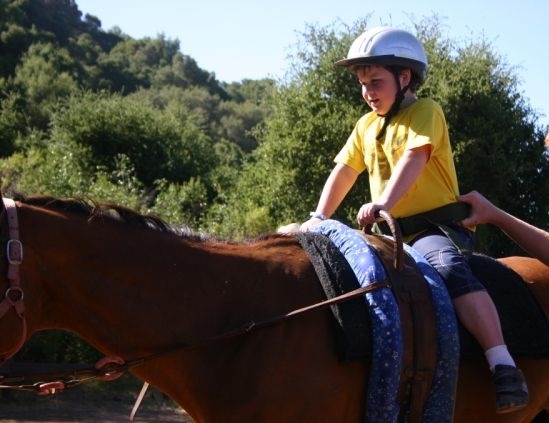 My mom has been suggesting it for a while (by proxy telling me to tell you to take him riding) She and my dad volunteer at a place in their town that does horse riding for special needs kids. I think I never said anything because you already have a busy busy schedule, a trampoline, and a pool, and I figured why poke you up to add one more activity into the mix. I'm so glad he enjoyed it!!!! Yay!! !